In the world of modern telephony and communications, businesses have an increasing number of options from which to choose. No longer relegated to the standard hard-wired desk phone systems of years ago, companies can utilize new technology to slash costs and improve productivity - in the office and on the road. VoIP has really led the charge here and is available in a variety of flavors, including what is commonly called the softphone. To properly understand what a softphone is, it is best to first understand some basics of phone technology. You already know that Voice over Internet Protocol, or VoIP, transmits voice data over an Internet connection. This contrasts to traditional telephone systems in which voice data travels through what can be a complex system of circuits, wires and channels. These are generally referred to as Public Switched Telephone Networks (PSTN) or Plain Old Telephone Services (POTS). VoIP replaces the circuits and wires connecting two endpoints (individual wired telephones) with an Internet pathway. In the process of sending voice information from one point to another, a VoIP system chunks it up into small pieces called packets. Breaking it into small pieces allows it to move along faster for better quality of service. The packets are put back together at the receiving end as though they were never broken up. Many businesses use VoIP with their company-wide PBX systems. All desk phones within an organization can utilize the network-wide VoIP system. 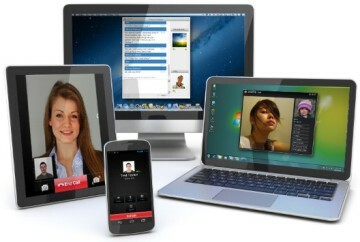 Softphones essentially extend the reach of VoIP technology. It allows desktop computers, laptop computers, tablets and smartphones (which are computers really) to be used for making voice calls—and more—over the Internet. It is simply a software application, often referred to as a 'soft client', that runs on a computer device (such as mentioned like your desktop, laptop, tablet or smartphone). 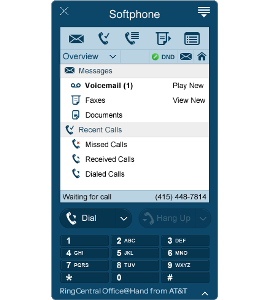 When you open the "app" on your device it will typically look like the dialer interface on a cell phone. You can use your mouse or touchscreen to dial the number you want to call. There are a variety of choices on the market, some that are free and some that require a small fee to purchase. The cost can depend on what platform you require the app for, such as Windows, MacOS, Linux, Android or iOS as examples. The first place to start is to select your software - we will review some options in more depth lower down this article but basically you have a choice of selecting a standalone option that can work with many different VoIP providers, or by selecting a proprietary option from your service provider (if available). Your selection may depend on the VoIP service provider you plan to use for your phone service. Once you have made your selection, it is time to turn your attention to the hardware. An Internet connection is a requirement for VoIP. This can be your home network, work network, or a WiFi connection at your location. If you wish to use your smartphone with your application, you have some choices here. You do not need to have an active cell phone plan in order to use the application as calls can be transmitted via WiFi, otherwise they can also be transmitted via the 3G or 4G network connection. With the addition of a headset (for desktops, laptops and tablets), you can make phone calls from these devices. Alternatively you can use a seperate microphone and speaker set (some devices include a microphone as part of an onboard webcam and many devices include some form of speaker which can save the need for an additional headset). Clearly, a headset is not needed for a smartphone but can be utilized just as you would now for hands-free working. You will need an active VoIP service account with which to obtain a phone number and to act as the carrier for your phone calls (connecting your voice call to the number you are dialing). Portability: It helps you to "break the chain" from your deskphone. Great for road warriors or telecommuters who are often away from their office desk but need to stay connected with customers and/or people in the office. Features: Many the features of your business phone system are typically included. Improved productivity: Staying connected no matter where you are can help improve productivity and increase customer satisfaction. Business number continuity: You can set the outgoing caller ID so that when you make a call from your device it shows your business number. Receive calls from your business number on any of your devices. Ease of use: The apps are very easy to use and intuitive. They are also easy to upgrade when required or when new features are available. Reduced business costs: Last but not least, it can help reduce business costs. They can replace expensive IP deskphones, reduce cell phone charges such as roaming when out of town (when using WiFi), reduce cell phone minute usage when on business, and/or save on expensive phone calls from hotel rooms, to name a few. It is a software application, and like any software application on a complex computer device there can sometimes be hangups or technical issues. If you have multiple hardware platforms that you want to use this on then you may need to get multiple applications, one for each platform (i.e. iOS, Android, desktop PC etc.). Still not sure if this might be right for your business? Read our 10 things you need to know about mobile solutions for your business article for further information. As mentioned above, you have two main options to consider. The first is by adding this to your existing VoIP service with your provider’s own proprietary soft client. If you have RingCentral VoIP services, for example, you get RingCentral for Desktop at no additional charge. 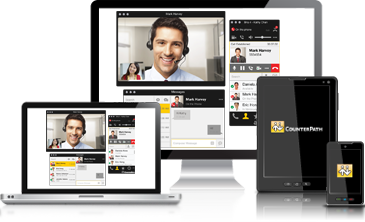 The other option is by purchasing a standalone application that can work with most VoIP provider systems. Certainly the prices vary and that is due in large part to the wide variance of features. It can actually be very difficult to do a true apples-to-apples comparison of the options as they are so wildly different. With that in mind, let’s take a look at some of the available offerings. Providers that offer softphone functionality as part of a larger integrated VoIP service can be a great option for many businesses. They have developed the app for their system and likley optimized it appropriately. Let’s take a look at two of the big names in this arena. For an in-depth look at some options check out our Mobile Calling Apps for Business article. A clear leader in the world of business VoIP services today, it’s no surprise that RingCentral would get into the softphone game. And, it is also logical that they provide this application free to businesses with RingCentral Office. RingCentral for Desktop is one of the most full-featured of any of the desktop applications—but it is only available to RingCentral Office customers. RingCentral gives you far more than just the ability to make calls from any device. 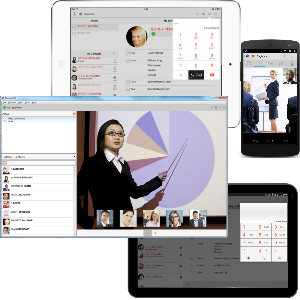 You can conduct video conference meetings with the service from your tablet or smartphone, enjoy call history and contact integration between devices, send and receive faxes and business SMS messages, download recordings and more. Other features also include call blocking, call park, call flip, call transfer and call screening. Prices for this service range from $24.99 to $44.99 per user per month, depending on how many employees will be using the system (the higher the number of users, the better the rate). Basically, you get what you pay for. Visit Ringcentral for more information. This European company offers a highly robust and integrated solution with clients for Windows, Mac, Android and iOS devices. It also provides full integration with Microsoft Office 365, securing its place as a viable option for enterprise businesses. Anything you can imagine you would need or want to do on a softphone, you can do. As for pricing, these guys take a unique approach to their structure and base costs on the number of inbound or outbound calls happening at the same time (simultaneous calls, often referred to as concurrent calls). Extensions are unlimited and prices are free for systems with a maximum of two simultaneous calls with fee-based options starting at $395 for four simultaneous calls all the way up to thousands of dollars for larger implementations. 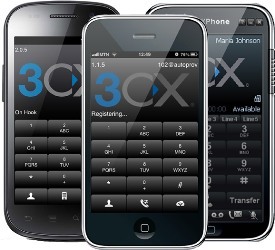 Visit 3CX for more information. Within the realm of softphone apps not tied to a specific VoIP service provider, there are a wealth of options. Even after several hours scouring their different websites, it is all but impossible to find a consistent feature list for an accurate comparison. Given that, let’s look at a few individually. Counterpath realizes that some businesses may only want softphone functionality on select devices. It's Bria app comes in different versions with accompanying different prices for desktops (including laptops), tablets and smartphones. The desktop/laptop version is compatible with Windows, Mac and Linux systems with a $49.99 price tag. The tablet and smartphone apps are available for Android, iOS and Blackberry for $12.99 or $7.99 respectively. Each app version is priced separately and will need to be purchased separately also if you want to use one for your desktop/laptop, one for your tablet and one for your smartphone. This can drive the cost up for this option, especially once you add your VoIP service costs on top of it. However, they are one-time costs so it can still be a good strategy. Bria 4 does allow histories to be synced between devices and provides collaboration from screen to screen (even for non-Bria users), contact management, IM and presence. Its user interface is also very sleek and easy to navigate. They do have an option called X-Lite allowing you to trial their app for free that may be of interest as a test. One of the standouts for the Bria is it's reliability - it just works. It also has a built-in troubleshooting procedure. If a call fails or it senses no audio packets in a given direction it steps through a process where it tries to help you, changing settings such as ICE and STUN in turn until you have a winner. Visit Counterpath (Bria) for more information. Of all companies in this space, Zoiper seems to tout security more than the others. Full encryption of calls, texts and videos is provided with the Zoiper app. They also really try to appeal to businesses looking for the best pricing. Their website even suggests that you can utilize multiple VoIP providers to always secure the best pricing for calls to different countries. They also offer free calls within the Zoiper network. As for pricing, this is where it gets really tough with this app. They show a US sales phone number but the prices on the website are all in Euros. Based on current exchange rates it is in the $33-$36 price range. There was no live chat option for more information, only an email contact form that asked for some pretty detailed information. So, if you want the ability to do some easy research on features and pricing on your own without having to fill out forms, etc, Zoiper’s not the solution for you. Visit Zoiper for more information. With iOS, Android and Windows compatibility, this app seems geared toward smaller or mid-sized businesses. It offers both voice and video calling over Internet or cell phone networks. Individual and group chat, presence, video share, image sharing, file sharing and private branding all are available with this software. People interested in pricing must send an inquiry according to the website. This is a shame as this can impede with your ability to shop and make an immediate and easy decision but may well be worth your while. Visit Media5 for more information. With the extreme range of options, features and prices (and lack of access to some information), it is really impossible to answer that question. Businesses looking for softphone features can start by deciding how broad their implementation is. If you have a smaller or medium sized business, you may want to investigate the wide selection of standalone options first. This is because the lower cost VoIP providers tend not to have their own proprietary solution. Larger businesses may want to go with providers that use their own proprietary solutions.